The Vocal Library. 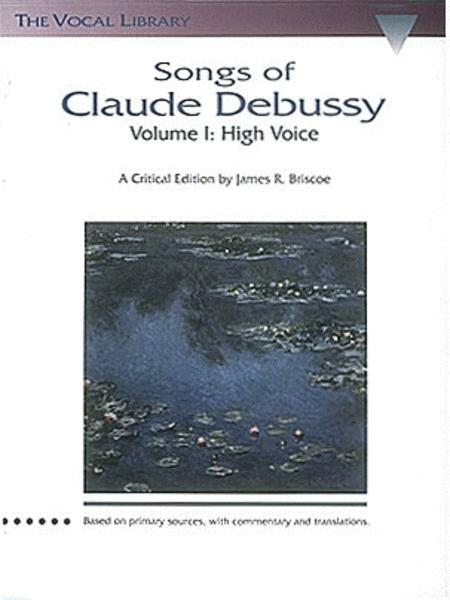 Composed by Claude Debussy (1862-1918). Arranged by James R. Briscoe. Vocal Collection. Collection, Classical, Romantic. 168 pages. Published by Hal Leonard (HL.660164). ISBN 0793529875. 8.5x11 inches. Critical edition by James Briscoe. A major new critical edition of important standard repertory with 61 songs in 2 volumes. All songs are presented only in the original key, with no transpositions. All the song cycles and groupings appear in one of the two volumes. Years in preparation, this edition is based on the most reliable sources available in the world, with most of the research centered at the Bibliotheque Nationale in Paris. Each song is presented with a line-by-line translation and full critical notes citing the research as it applies to specifics in the songs. Also includes a glossary of French terms. Contents: Nuit d'étoiles • Fleur des blés • Zéphyr • Aimons-nous et dormons • Jane • Pierrot • Rondeau • FÉte galante • Beau soir • FÉtes galantes pour Madame Vasnier (Pantomime; En sourdine; Mandoline; Clair de lune; Fantoches) • Apparition • Récti et Air de Lia • Ariettes oubliées (C'est l'extase langoureuse; Il pleure dans mon coeur; L'ombre des arbres; Chevaus de bois; Green; Spleen) • Cinq poèmes de Charles Baudelaire (Le balcon; Harmonie du soir; Le jet d'eau; Recueillement; La mort des amants) • Trois mélodies (La beele au bois dormant; Voici que le printemps; Paysage sentimental). November 15, 2007 wonderful pieces! it helps me a lot with my PhD. 35 of 62 people found this review helpful.